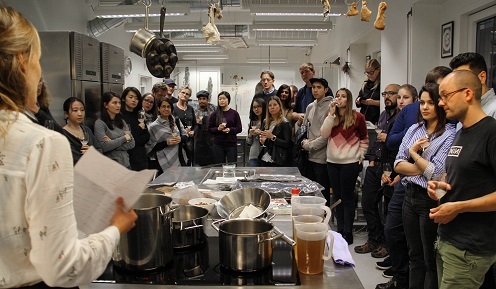 The Nordic Food Lab at the Department of Food Science at the University of Copenhagen has started the lecture series “Monday Aperitivo”, which will be held on the last Monday of the month and everybody is welcome. The lectures will explore the intersection of gastronomy and science and the lectures will be given by personalities in the two disciplines who have been invited by the Nordic Food Lab. Picture by Julia Sick from the first Monday Aperitivo in Nordic Food Lab at The Department of Food Science. Monday Aperitivo is an informal forum where food and science are discussed passionately in order to find new ways to stimulate the appetite. The goal is to create an inspiring forum that can connect, inspire and challenge researchers, chefs, the food industry and others who have a passion for food and science. 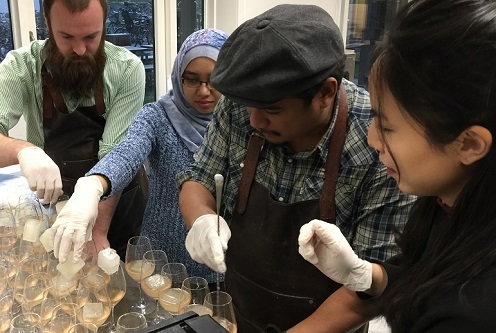 Responsibility for Monday Aperitivo rotates among the team members at the Nordic Food Lab and scientific assistant Louise Beck Brønnum, who has just been working with extraction in the research project Taste for Life, was responsible for the first event. To demonstrate extraction and infusion, she invited the chef Philipp Inreiter from Slurp Ramen Joint, who is an expert in Japanese noodle soups, and bartender Geoffrey Canilao from Balderdash. The latter runs a cocktail lab in the bar to find new, delicious flavour combinations for the drinks menu. Speaking from the Department of Food Science was professor of gastrophysics Ole G. Mouritsen. In the video, professor of gastrophysics Ole G. Mouritsen talks about the fish katsuobushi, while chef Philipp Inreiter from Slurp Ramen Joint demonstrates how to make a delicious Dashi – a broth based on seaweed and in this case katsuobushi. Dashi, which can also be made from mushrooms, is the foundation for Japanese noodle soup (ramen). The first Monday Aperitivo was about creating flavour via extraction and infusion based on the fifth taste umami, which can be extracted from seaweed, tomato, mushrooms and anchovies. Philipp Inreiter made fish stock from katsuobushi (dried and smoked bonito tuna) as well as a vegetarian version from mushrooms, while Ole G. Mouritsen talked about the ingredients in Dashi that make it so irresistibly delicious as well as how the umami flavour is created. In addition to the Dashi, the audience also had the chance to taste Geoffrey Canilao’s cocktails, including Who Shot You made from vermouth, champignon and seaweed. Monday Aperitivo, which always has a special theme, will take place on the last Monday of the month from 16:30 to 18:30. The tickets cost about 125 kroners and can be purchased via Billetto. The location is the Nordic Food Lab at the Department of Food Science, which is housed at Frederiksberg Campus of the University of Copenhagen, Rolighedsvej 26, 1958 Frederiksberg C.
The next Monday Aperitivo is Monday, 27 November 2017. The theme has not been determined yet, but you can follow @Nordicfoodlab on Instagram for future announcements about Monday Aperitivo. Generally, the theme is based on a scientific and gastronomic passion of the team member from the Nordic Food Lab who is organising that Monday Aperitivo.